On 10 February 2018, the WA State Government announced the first round of funding of its Aboriginal Ranger Program, awarding $8.4 million to successful applicants. Over the next five-years this program will provide a total of $20 million to support Aboriginal people in the management and conservation of their traditional country. Yamatji Marlpa Aboriginal Corporation (YMAC) empowers all of our Traditional Owner communities in realising their conservation and land management objectives by supporting them to be the decision-makers on their Country. As one of the successful applicants in the first round of funding, YMAC – on behalf of Malgana Shark Bay People’s Native Title Claim Group – will receive funding for the employment of one Malgana Ranger and one Land and Sea Management Coordinator for 18-months, as part of the proposed “Pathway to a Malgana Country Land and Sea Management Program”. The first round of funding was very competitive with 58 applications requesting over $60 million in funding and only 13 programs awarded funding. YMAC CEO Simon Hawkins said, “The State Government grant is a good first step in involving Malgana Traditional Owners in the management of their traditional land and sea country in the Shark Bay area.” Currently, the majority of the Shark Bay area is classified as either: ‘National Park’, ‘Nature Reserve’, ‘Conservation Park’, ‘Marine Park’ or ‘Marine Nature Reserve’, and managed by the Department of Biodiversity, Conservation and Attractions (DBCA). “Shark Bay has been recognised for its unique and outstanding environmental values, evidenced by its inclusion on both the National and World Heritages Lists, and this initiative has the potential to become a comprehensive Malgana-led land and sea management program for the entire Shark Bay area,” Mr Hawkins said. “For many years, Malgana Traditional Owners have indicated their strong desire to be directly involved in managing the vast conservation estate in the Shark Bay area. Whether it’s through direct employment with the State agency responsible for conservation and land management, or through formal and legally binding partnerships involving the Traditional Owners and the State of Western Australia, these aspirations are gradually taking shape,” he said. “It’s a positive outcome for the Malgana community that will generate local economic, training and employment opportunities, as well as generating environmental and cultural outcomes,” Mr Hawkins said. The recently produced ‘Gutharraguda Land and Sea Country Management Plan’, endorsed by the Malgana Shark Bay People’s native title working group (‘Malgana Working Group’), clearly articulates some of these aspirations, alongside a set of values and assets, both natural and cultural. Set-up a Malgana reference group which will act as an interface between the wider Malgana community and all stakeholders with an interest in land and sea management in the Shark Bay area. This group will also form part of the negotiation team on behalf of Malgana People when Indigenous Land Use Agreement negotiations start in earnest with the State of Western Australia. Employ a Malgana Ranger within DBCA’s Denham office. Train six Malgana People (three females and three males) in accredited conservation and land management modules. Employ a Malgana person in a coordinating position to facilitate support, and manage the program. YMAC is in the process of signing the funding agreement with the State Government, on behalf of the Malgana Shark Bay People’s Native Title Claim Group. YMAC will support the Malgana on its projects and ensure Malgana People are directly involved in the decision-making and practical management of the cultural heritage and environmental assets on their Country. 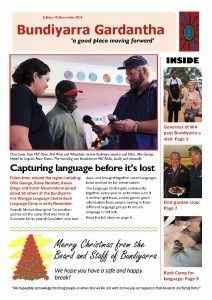 The December edition of Bundiyarra Gardantha, the newsletter produced by the Bundiyarra Aboriginal Community Aboriginal Corporation, is now available for download. In this issue, Bundiyarra shares stories from its successful language bush camp, photos of a visit by The Honourable Kerry Sanderson AC, Governor of WA, and the exciting work being done to protect the language of the Malgana people from Shark Bay. Bundiyarra Gardantha, which means “a good place moving forward”, is a quarterly newsletter which has been produced with help of a grant from the City of Greater Geraldton. Digital copies of back issues are available on the Bundiyarra website here, and you can request to be added to their mailing list by contacting them by email. A WA-produced documentary about Malgana man Jimmy “Paddy” Poland will be shown on NITV (SBS) over the next three years. “Shark Bay Salt Water Stories: Yarning with Jimmy” is a collection of stories looking at Jimmy’s life growing up around the Gutharraguda (Shark Bay) area over nine decades. The film tells his stories about growing up in the Shark Bay community, how he worked as a fisherman, stockman, shearing hand, and cook, and how he learned how to carve pearl shell, emu eggs and boab nuts from his father. You can watch an excerpt here and learn more about the film at the Facebook page here. Join Malgana elder Ada Fossa as she speaks about her book “Stories Laughter and Tears through Bygone Years in Shark Bay” this Saturday in Geraldton. “My name is Ada Mary Fossá, born Ada Mary Poland on the 8th November 1934. I am a 6th generation Indigenous resident of Shark Bay and also a Malgana elder. This book is a collection of stories from my memories of growing up and living in Shark Bay with input from some old time residents also included. The Western Australian Indigenous Tourism Operators Council (WAITOC) has announced Malgana Traditional Owner Darren Capewell will feature in a series of Aboriginal food and drink showcase experiences in WA. Over the course of 2014, WAITOC will showcase ten Aboriginal Gourmet Experiences across Australia, from food and produce, seafood, food events, cafes and restaurants. Darren Capewell from Aboriginal tourism operator Wula Guda Nyinda Eco Adventures will be the second to feature in the 10 month series. Click here to visit the WAITOC website. 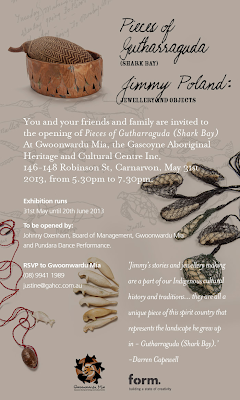 After the success of Jimmy Poland’s Pieces of Gutharraguda exhibition opening in Shark Bay in May, the exhibition will now travel to Carnarvon, where it opens at the Gwoonwardu Mia Cultural Centre this Friday, 31 May, from 5:30 to 7:30pm. 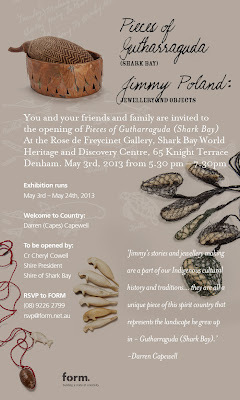 At 86 years old, respected Malgana elder and local Denham community icon, Jimmy Poland, has been carving pearl shell, emu eggs and boab nuts for many years – a skill that was passed down from his father – and he tells the story of his life in Shark Bay through the Pieces of Gutharraguda exhibition. The exhibition will run from 31 May to 20 June 2013. For details about the exhibition opening, please see flyer below. Respected local Denham community icon, Jimmy Poland, will tell the story of his life in Shark Bay through an upcoming exhibition of his jewellery and artwork called Pieces of Gutharraguda. At 86 years old, Malgana elder Jimmy has been carving pearl shell, emu eggs and boab nuts for many years – a skill that was passed down from his father – but this is the first time his works have been documented visually as part of Malgana cultural history. Through a mentorship program supported by contemporary WA arts organisation, FORM, Jimmy has been able to work with leading WA jeweller and designer, Helena Bogucki. His pieces reflect the evolution of Gutharraguda (Shark Bay) country, as well as the fishing and pastoral industries of the town. Pieces of Gutharraguda will be showing at the Rose de Freycinet Gallery, Shark Bay World Heritage and Discovery Centre, 3-24 May 2013. The exhibition will then travel to Gwoonwardu Mia Gascoyne Aboriginal Heritage and Cultural Centre in Carnarvon, Port Hedland Galleries, and Perth. For details about the exhibition opening, please see the flyer below. Language Awareness Community Workshops on the languages of the Murchison-Gascoyne Regions (including Badimaya, Malgana, Nhanda, Wajarri and Yinggarda). Bundiyarra Irra Wangga also has a range of educational material available, including books, posters, flashcards and the recently completed Wajarri Dictionary. Irra Wangga strives to preserve, maintain and promote the languages of the Murchison-Gascoyne regions of Western Australia, which are becoming increasingly threatened and endangered. The language program is currently looking for sponsors to help with the delivery of language related activities that assist the whole community to grow in understanding, pride and the learning of Aboriginal languages. If you are interested in sponsoring any of the language program’s activities or events, please contact Jennifer Kniveton, Language Program Coordinator, on (08) 9920 7900. For more information on any of these programs, or to purchase educational materials, please contact Irra Wangga directly on (08) 9920 7950.